With the end of one beloved red fruit begins the start of another! As if the picture isn’t a dead giveaway, I’m talking about cherries! 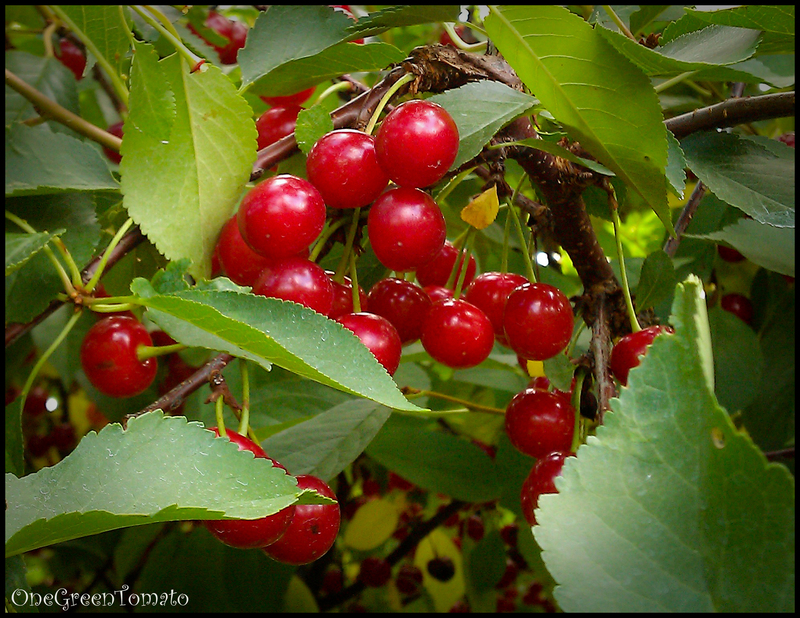 The first to ripen are sweet cherries. Sour cherries (my favorite) shortly follow. Then just as quickly as they come they go! 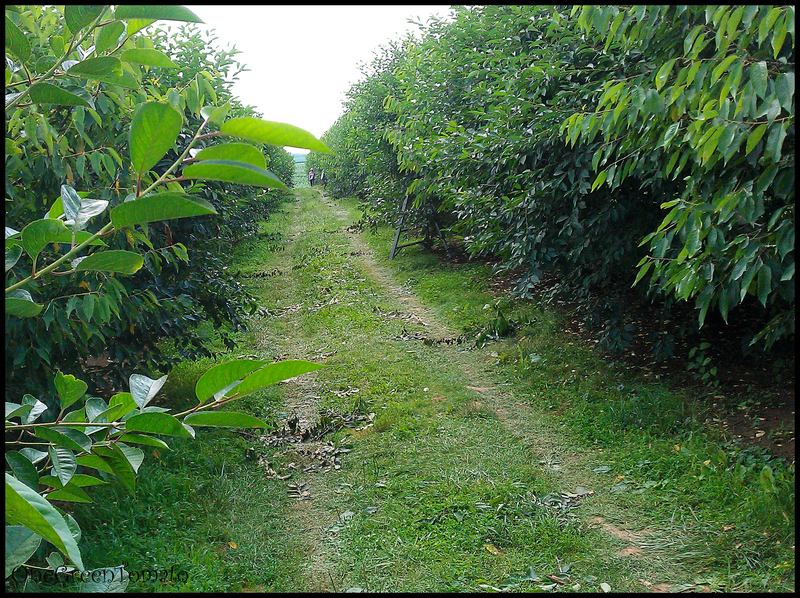 Last week, I made two trips to Cherry Hill Orchards and managed to pick 23 pounds of sour cherries and fall out of a tree… technically I was knocked out of it by a New Yorker in his land-yacht of an SUV! But fall from the tree I did! You can see from the picture above that cars actually drive through the orchard; I’m guessing that must be where overflow parking is. So I’m on one of the tall ladders all up in the tree and this guy comes barreling down the path. I’m guessing his side view or tire caught the edge of my ladder because down I went! Thankfully my cat-like reflexes kicked in and I landed on my feet. Dude never stopped or slowed down…I’m guessing he had no idea what happened. Seriously, YOU’RE IN AN ORCHARD, slow down! Now, I’m sure you may (or may not) be asking yourself what ever does one do with 23 pounds of sour cherries? Why one makes cherry pie filling, jams, ice cream, pie, turnovers, scones, salad dressing, and dehydrates them of course! You can see I’ve been a very busy little bee! I tripled the quart instructions (which is allowed) and omitted the cinnamon and red food dye to make 6 pints. In actuality, it ended up being more like 9 pints so I canned 6, froze 2, and baked turnovers and a pie, since I only had 6 sterilized jars at the ready! Rinse and pit fresh cherries, and hold in cold water. I pinched mine the night before so I didn’t put them in water. If you want to prevent them from browning where the stem was removed (I never do), you can treat them with some absorbic acid or Fruit Fresh. Place the cherries in a gallon of boiling water 6 cups at a time and boil for one minute once water returns to a boil. Drain but keep them heated in a covered bowl or dish. For this step, I heated my enamel-covered cast iron dutch oven at 200° F for about 15 minutes, worked great! Combine the sugar and clear jell with water in a large pot and add water and almond extract. Stir the mixture and cook over medium-high heat until it thickens and begins to bubble. Add lemon juice and boil one minute, stirring constantly. 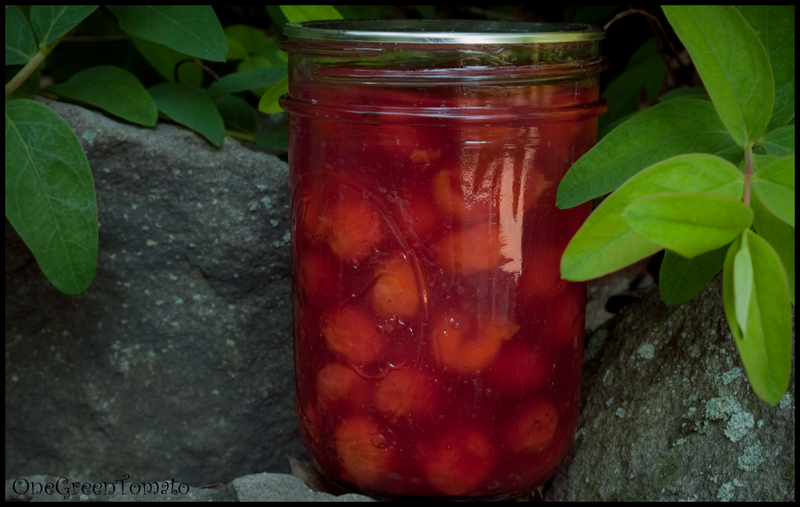 Fold in drained cherries immediately and fill hot jars with mixture without delay, leaving 1″ headspace. Adjust 2 piece lids to fingertip-tight and process in a boiling water bath for 30 minutes or your recommended altitude processing time. In a large bowl, sift flours, salt, and baking powder; cut in butter and shortening with a pastry knife (or two forks) stopping when mixture resembles a course mix about the size of a pea. Sprinkle 3 tbsp of ice water over the dough and blend it lightly. If the dough can be gathered into a ball, don’t add any more water. If not, continue sprinkling ice water one tablespoon at a time. Try to not overwork your dough as this brings out the gluten and makes your pie crust tough. Divide the dough into two balls, one being about 2/3 of the dough; this will be the bottom crust, the smaller one will be the top crust. Place each ball of dough between two layers of wax paper and roll out into a disk. Place the disks in the fridge for an hour. After the dough has chilled, roll them out and place the large one into your pie plate, add pie filling, then add the top crust. Pinch your edges together and cut several slits or X’s into the top to vent the steam. Bake in a preheated oven at 450°F for 30 minutes. I actually didn’t make my pie this way. Instead, I made turnovers. After about 8 turnovers, I got tired of messing with the dough so I used the rest to bake up a small pie. Since my pie was so small, I only baked it for 15 minutes, like I did with the turnovers. As you can tell by the picture, the pie was good. Like, really, really good. So good that I ate the entire pie without taking a picture. 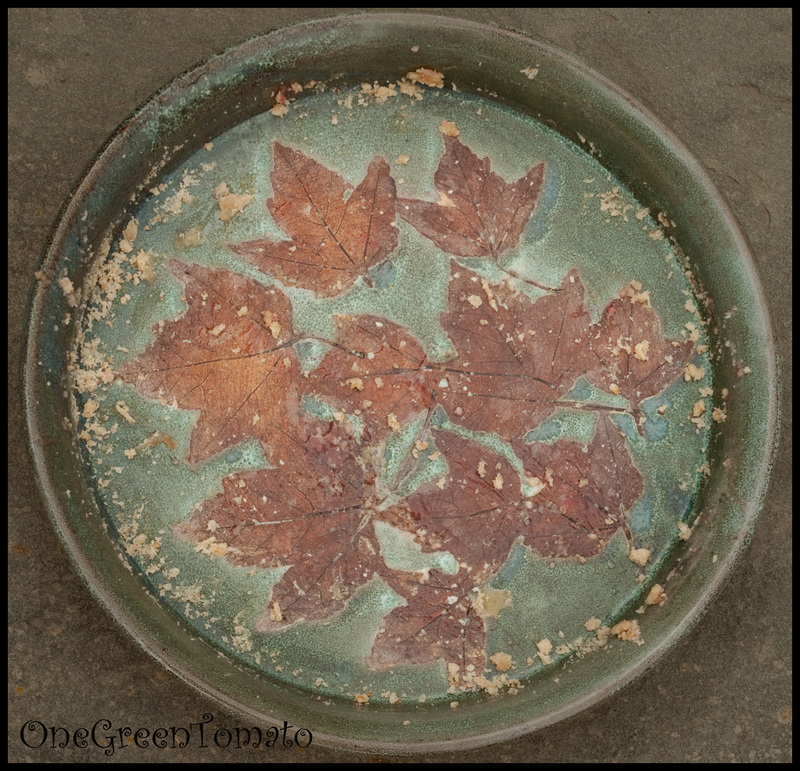 In my gluttonous defense, this particular piece of pottery is rather small and quite shallow, it held about a jelly jars worth of filling… and I ate said pie in 2 days, not one. Hi there – I stumbled upon here from Punk Domestics and really loved the photography on the post. I just finished a batch of sour cherry pie filling using similar instructions and also found it made a lot more than the recipe stated. Mine jelled almost instantly, so I must have the kind of Clear Jell you warned against (it got frustrating to bring it to a boil before bottling because the mixture was so thick that I was risking scorching on the bottom). The filling tastes great and I’m looking forward to a delicious cherry pie in the dead of winter. Happy Canning! Thank you so much for your kind words about my photography! Photographing food (and making it look appetizing) is the bain of my existence! haha Sounds to me like you have instant clear jell. My excess uncanned pie filling went into the freezer, and every time I open it to get something I just stare at it longingly! I love using summer produce in the dead of winter!